To say my schedule is looking a little bit hectic at the moment is… a bit of an understatement. Tomorrow, I will be going to the hospital to give birth to my third child. (Yay!) And it looks like surgery will likely be involved because of complications. (Boo!) Which means that I’ll likely be recovering for quite a while afterwards! Which, to be honest, makes me question my timing of releasing another book. After all, when you release a book, you’re supposed to market it and advertise it and everything so that people actually know about it and can figure out whether they want to buy it or not. And, let’s face it, laying around and recovering from a major surgery while cuddling with a newborn is not very conducive to marketing at all! …a very sobering cover, isn’t it? Why did He suffer and die like this… for me? To be completely honest, I don’t like thinking about the Passion. It makes me too uncomfortable. Even when I temporarily drifted away from the Catholic faith and was starting to doubt the divinity of Jesus, the mere thought of Christ’s Passion and Crucifixion made me stop and squirm. It is one thing to shrug off unconditional love — rebellious young adults and children do it all the time, and I was no exception. But, to shrug off the Cross? That is harder to do. Yet, it was the Cross that helped bring me back to Jesus and prayer in general. Because, even when I came to realization that Christ and Christianity was indeed real, I was still afraid to approach Him, for I knew that to approach Jesus was to approach the Cross. And the Cross terrified me, because it meant that I would have to approach my own cross and carry it. It was only until I realized that I would have to carry my own cross and suffer anyway till I really realized that I had two choices to make: I could either carry my cross alone, or I could carry it with Jesus. In those days when I was still sorting out my faith, I didn’t really know how to pray very well. Fortunately, the Rosary is a very easy prayer to start off with, even for the lowliest of beginners. And so, that is the prayer I started. And there, despite my longing to stay away from the Cross, I found myself contemplating the Cross once more in the form of the Sorrowful Mysteries. At the time, I was going through quite a bit of suffering — some of it self-induced, some of it not — and I clung to the Sorrowful Mysteries like a shipwrecked survivor clings to a life raft. After all, when one encounters suffering, one encounters the Cross. And, where there is the Cross, one can always find Jesus if one looks hard enough. It was during this time, when I clung to the Sorrowful Mysteries, where I started praying the Rosary consistently. It was during this time, when I clung to the Sorrowful Mysteries, where I learned how to make rosaries so that I could send them to those that I loved. It was during this time, when I clung to the Sorrowful Mysteries, that I started offering, quite awkwardly, to say the Rosary with people. 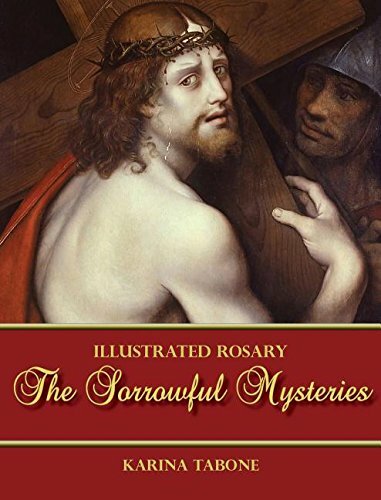 And now, years later, I am about to release a book — just in time for Lent — about the Sorrowful Mysteries of the Rosary. 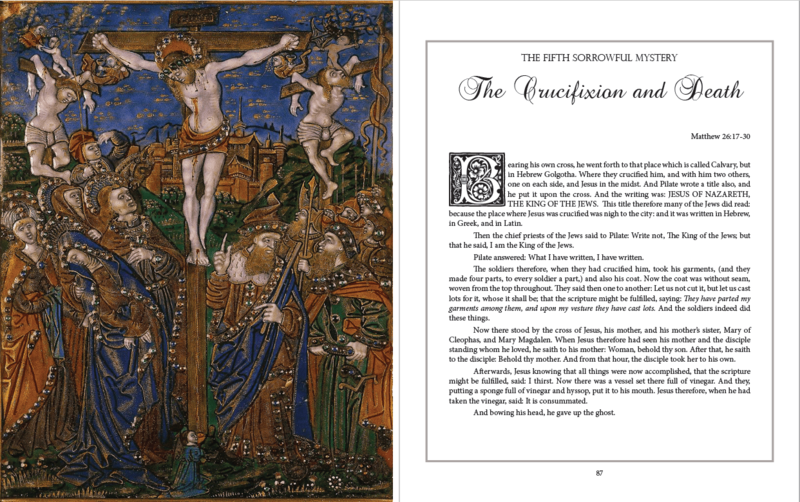 My new book, The Sorrowful Mysteries, is laid out very similar to my previous book, The Joyful Mysteries, though I wouldn’t call it very pretty, as it does depict some rather brutal imagery. 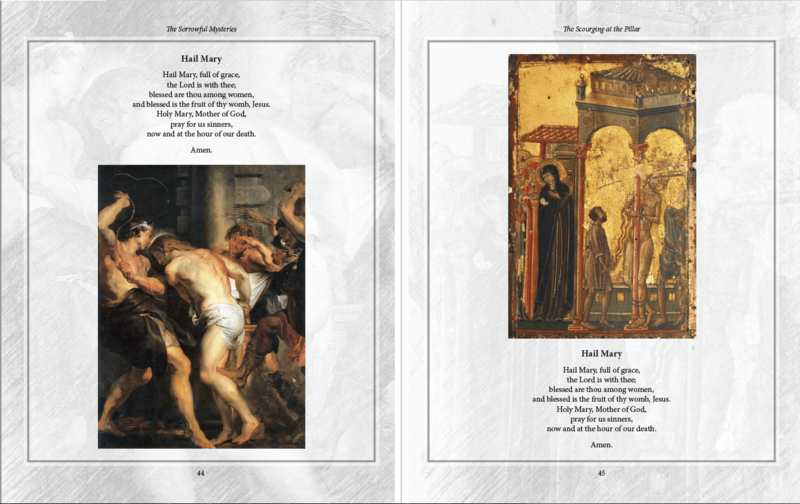 Still, it features every individual prayer of the Rosary — from the Sign of the Cross in the Introductory Prayers, to the final prayer of the Rosary — illustrated with classic, religious art from the public domain. Take a look at some of the pages! The first prayer is decorated with a scene of the suffering Christ being received into Heaven (spoiler alert!) while the next introductory prayers are illustrated with Christ’s Triumphant Procession into Jerusalem, as a kind of reminder of Palm Sunday, in which we celebrate with Palms the coming of Christ and then later, in that same mass, read through the Passion narrative. Honestly, this French piece of the Crucifixion made in the 15th century just astounded me with its artistry and fine detail work. Here’s a scene from the Agony of the Garden, where Christ is in the heavenly light and an angel appears to Him, while His disciples sleep in darkness. Scenes from the Scourging at the Pillar. There are a very wide range of artworks featured, from beloved icons that have made their way to museums all the way to fine religious art from the Renaissance that still decorate European churches today. Did I mention that there were lots of Hail Marys? 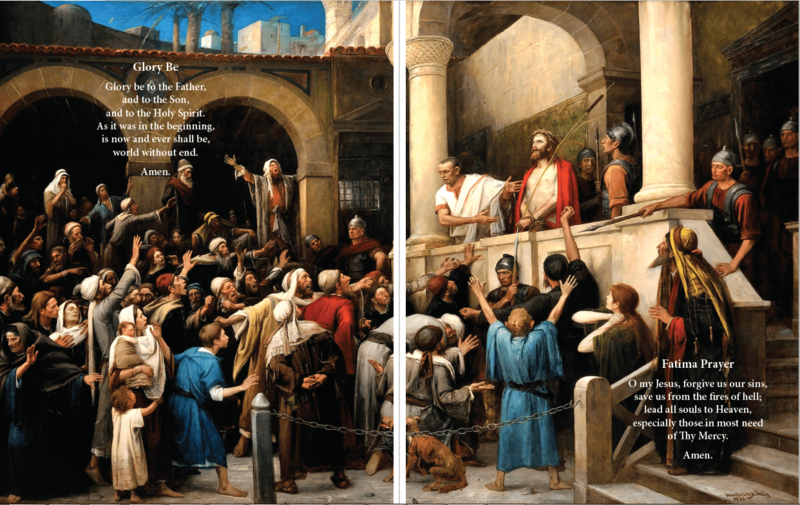 These scenes depict the Carrying of the Cross… both from afar and close up. Each decade ends with the Glory Be and Fatima Prayer, of course! 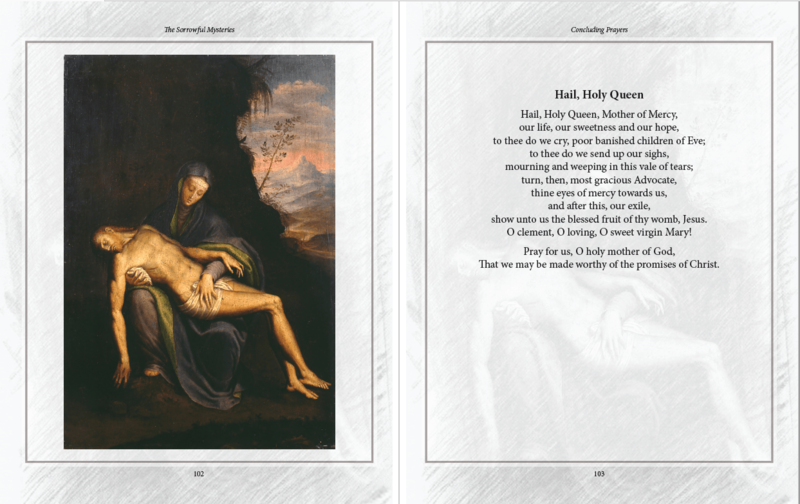 The concluding prayers feature images of the Pieta, in which our Blessed Mother cradles the dead Christ in her arms. …as you can guess, it’s been quite a journey to get this book done! 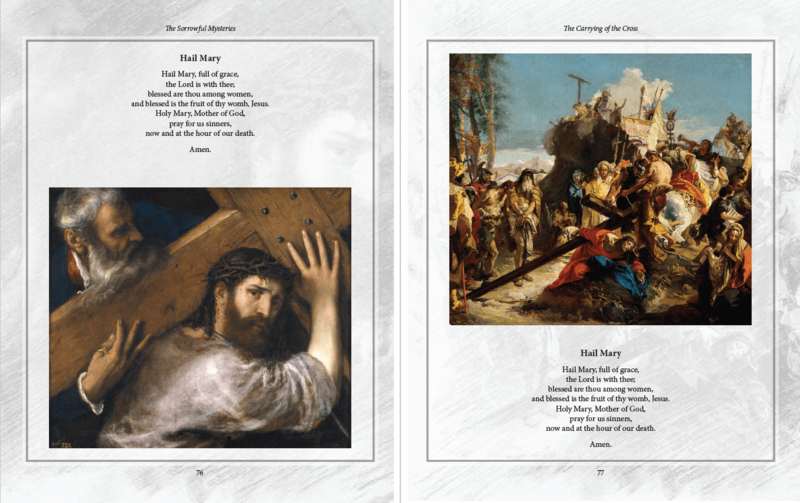 On February 6, just in time for the beginning of Lent, my book, The Sorrowful Mysteries, will officially be released. It was during Lent in which I first approached the Cross with my eyes wide open, found Jesus there, and made room for Him in my heart. Even though the Passion of Christ made me feel dreadfully uncomfortable and uneasy at first, it was through Christ’s suffering in which I finally found the strength to meet with Him and surrender to Him and His Church. And it was through the Sorrowful Mysteries of the Rosary in which I clung desperately, even when everything in my life seemed to be falling apart. 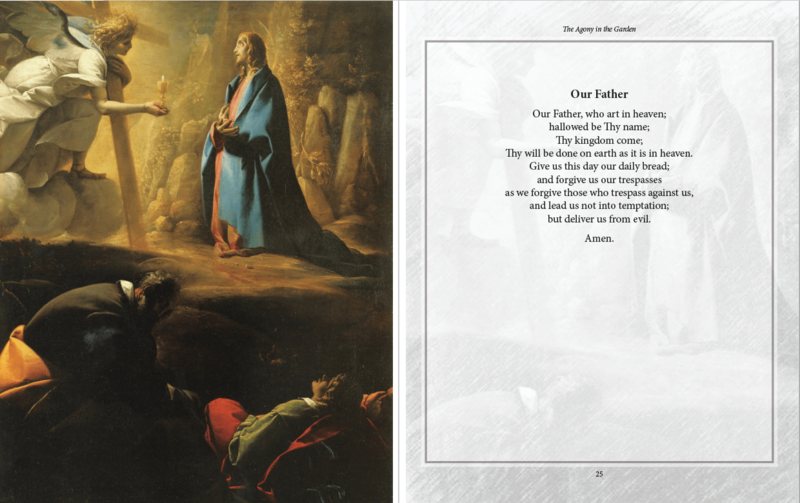 It is my sincere hope that this book might help you encounter Jesus as well and cling to Him — whether your own cross is light or heavy — and help you pray more devoutly to Jesus through the Sorrowful Mysteries of the Rosary. No prayers today, but if you could say a prayer for me, my child who will be born tomorrow, my family, and my medical staff, I would so appreciate it. Thank you, God bless, and I’ll see you all soon! 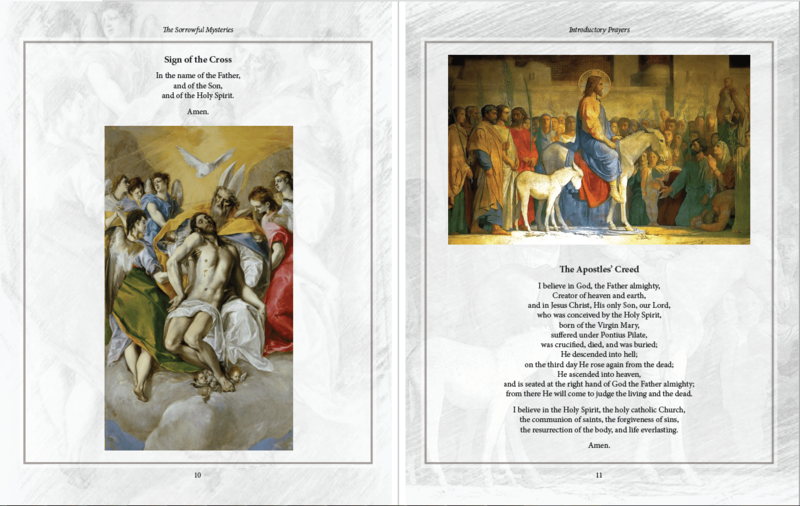 Just ordered the joyful Mysteries in hard back. Out of stock at the moment, but looking forward to it coming . Prayers for the baby.